Pianist and Eastman School of Music student Jenny Chen will perform in Weill Recital Hall at Carnegie Hall on Thursday, March 21, at 8 p.m., as part of the Eastman Presents in New York series sponsored by the George D. and Freida B. Abraham Foundation. Chen’s upcoming performance at Carnegie Hall features virtuosic compositions from the Romantic, Impressionistic and Modern musical eras. Chopin’s 24 Preludes, each expressing a unique emotion, are followed by Rachmaninoff’s radiant and sunny Lilacs. The cultures of Spain, France, and Russia are embraced with Liszt’s Feux follets and Rhapsodie espagnole (inspired by Liszt’s 1845 tour of Spain), Debussy’s impressionistic prelude Feux d’artifice, and the early modernism of Stravinsky’s masterpiece Pétrouchka. 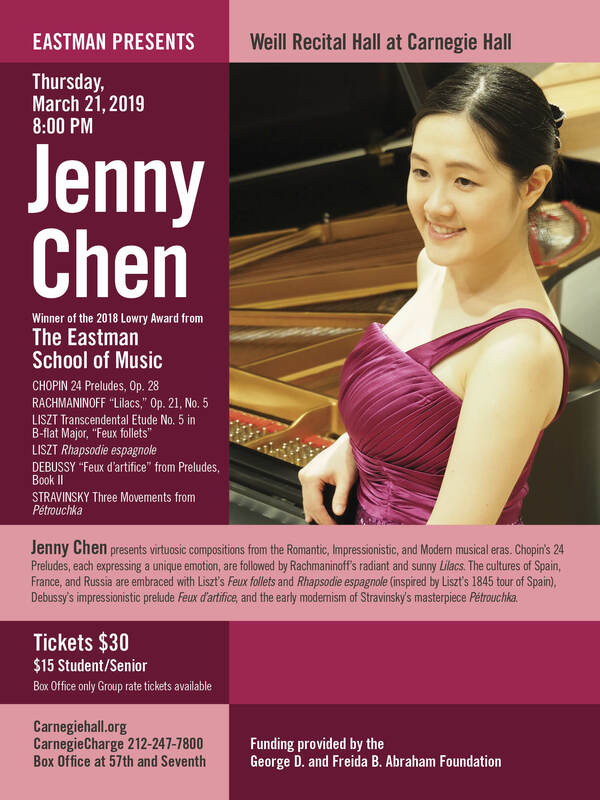 As the recipient of the Eastman School of Music’s Lowry Award, Chen will be performing in memory of former Eastman School of Music Dean Douglas Lowry. Dean Lowry became the sixth head of the Eastman School in 2007 and was named the first Joan and Martin Messinger Dean in 2011. A composer, conductor, and academic leader, he resigned in 2013 for health reasons and passed away the same year. Prior to his coming to Eastman, he served as Dean at the University of Cincinnati-College Conservatory of Music and as Associate Dean of the Thornton School of Music at the University of Southern California in Los Angeles. The award bearing his name is presented each academic year to a graduate student majoring in piano, voice, or string instrument to recognize outstanding levels of performance and creativity and provide the recipient the opportunity to present a recital in a prestigious New York City concert hall. Chen was born in Taipei, Taiwan. She earned her bachelor’s degree from the Curtis Institute of Music and her master’s degree from Yale University. Currently, she’s pursuing her Doctor of Musical Arts degree at the Eastman School of Music. Chen has performed with numerous ensembles, including The Philadelphia Orchestra, the Rochester Philharmonic Orchestra and the Taipei Symphony Orchestra. In 2015, Chen performed Mozart’s Concerto for Two Pianos with Anne-Marie McDermott and the Pacific Symphony. Her numerous honors include earning silver medals at the New York International Piano Competition and the Eastman School of Music’s Young Artists International Piano Competition as well as the Henk de By Incentive Prize at the International Franz Liszt Piano Competition in the Netherlands.